Design work started in 1944 following Standard's wartime purchase of Triumph, with the objective of producing a saloon and sports roadster, using a common engine, gearbox and similar running gear. 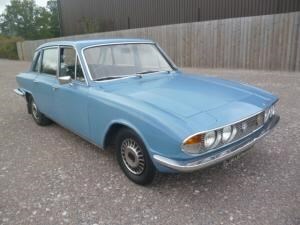 The 1,776cc overhead engine and gearbox which Standard had been supplying to Jaguar for their 1 1/2 litre saloon was initially employed using the existing Flying Standard rear axle. The chassis featured an all-new design which included independent front suspension and comprised of two large-diameter steel tubes joined by cross braces. With a shortage of post-war sheet steel, the main body panels were of aluminium alloy, the bodywork being styled by Standard's Frank Callaby, who included a dickey seat, similar to the design of the pre-war Dolomite Roadster coupe. Launched in March 1946 alongside the razor-edged 1800 saloon, the larger engine was introduced in 1948, featuring the 2,088cc, 3-speed gearbox together with a new rear axle, which came across from the newly-introduced Standard Vanguard. Power increased from 65 to 68bhp, raising the top speed of the Triumph 2000 from 70 to 77mph. The biggest concern with a 2000 is corrosion, and while poorer quality steel makes facelifted Mk 2 models more susceptible all will need careful checking. The sills are the first place to look as rot here can easily spread to the floor and chassis outriggers with expensive consequences. As it is, their complex three piece construction can lead to bills of £1000 per side for replacement. Blocked drain holes are a common cause of problems so check them thoroughly, especially if there’s evidence of recent bodywork repairs or restoration, and take a good look at the double-skinned front wheel arches, the door bottoms, and rear valance. The straight-six engine on the other hand is tough and reliable and should manage 100,000 miles plus before a major overhaul is needed. Replacing the canister oil filter with a screw-on type is a good move and it’s worth checking for signs of head gasket problems along with any issues affecting the crankshaft thrust washers. It’s a common Triumph problem that can lunch the engine if they drop out, so watch for excessive play at the crank pulley as the clutch is depressed. Keeping the twin Stromberg carburetors of early models in tune could be tricky and they may have been replaced with a more reliable set-up by now, but the Lucas fuel-injection on the PI shouldn’t cause trouble today – the system is well understood by specialists and should be fine if properly set up. Noisy layshaft bearings can afflict the 4-speed manual gearbox but it’s otherwise trouble-free. And if you suspect overdrive problems – the Laycock ‘A’ unit was replaced by the ‘J’ type after 1972 – wiring problems or a low oil level may be the cause rather than anything more major. The Borg Warner automatic is strong and proves reliable with regular fluid changes. One area worth checking though is the differential as leaking oil seals could have allowed it to run dry, while the raised ride height of post-May 1974 models could lead to cracks in the subframe bracket at the nose of the diff. Lastly, listen for clonks signifying wear in propshaft and driveshaft UJs – parts aren’t expensive but replacing them all is time-consuming. There’s not a great deal to worry about with the rest of the running gear, so it’s mainly a case of checking for wear and tear or neglected maintenance. Suspension bush replacement can be labour intensive while the rear spring top mounts can rot where they meet the inner wings and are tricky to fix. Otherwise, just watch for sloppy steering caused by worn rack mounting bushes and noisy rear wheel bearings as replacement requires the use of special tools. Some interior trim parts are scarce now so you’ll want to make sure everything is complete, and it’s worth checking for problems with collapsing seat bases, tears in vinyl or leather trim, or damaged wood veneers. The brushed nylon seat material used later wears well though. Tired interiors can obviously be re-trimmed but the cost can soon mount so budget accordingly if things are shabby. It’s also worth checking the state of the wiring as connectors and insulation could be showing signs of age, and if the dynamo on early cars has been swapped for an alternator, so much the better. The sharp Michelotti lines impressed visitors to the 1963 London Motor Show where the 2000 was launched, and the Rover P6 rival would go on to become a strong seller for the company. After the introduction of a stylish estate in 1965, buyers were offered a Mk 2 version in 1969 which brought a new dashboard design and seats amongst other changes, and then a further facelifted model in 1974. All told, around 270,000 examples were sold in total and driving one today makes it easy to see why so many people fell for its charms. The first thing you notice is just how roomy a 2000 is, and if you’re after a family-sized classic this British saloon will certainly fit the bill. And there’s always the lure of the estate if extra luggage capacity is a priority. There’s plenty of comfort on offer too, and while the improved seats and revised dashboard of the Mk 2 lift the interior ambience, all models prove excellent long distance machines. Cruising ability is certainly helped by the addition of the optional Laycock overdrive but even without it there’s decent refinement on offer, while the smooth, torquey six-cylinder engines keep things from feeling strained. The earliest models weren’t especially quick though, the 90bhp unit ensuring that 100mph remained out of reach with the 0-60mph dash taking a relaxed 13.5 seconds. Still, if you want pace you need to look to the fuel injected 2.5PI model that joined the range in 1968 which managed the same acceleration benchmark in less than 10 seconds. Smooth manual or automatic transmissions help the 2000’s easy going nature, and the rest of the controls are equally slick and well-weighted, although power steering is a useful addition if urban miles are on the cards. But whether in town or on faster roads, a well-judged ride keeps the worst intrusions at bay while the handling is safe and predicable rather than sparkling. The latter wouldn’t have bothered too many buyers at the time though and it doesn’t matter much today either in light of the big Triumph’s other attractions. Comfort and usability lie at the heart of the 2000’s appeal, and if family-sized classic motoring is required then look no further. Sharp styling and smooth driving manners add to the appeal, and while you need to be wary of rotten examples a solid one will be enjoyable indeed. In fact, it’s hard to think of a reason not to buy one.